Up early, going to a Cribbage tourney in Sacramento today. Wish me luck! Hey how is? Medical and weather reports, sick jokes, Keith's 22 and Wombat's poozles. Glad to see nothing has changed while I've been away. Hope you all have a 'sunny' day, too! Rage, isn't it nice that you can count on us??? Why not take the 13 while I'm here. We FINALLY have some sunshine! I love Ireland. Where are you, Rage? Now to spend some time on Wombat's poozle before I have to fix lunch. First things first, doncha' know. Not good timing for those jokes, D or A!!! Yikes! I certainly hope that TWA pilot wasn't fired and hired by Delta. BTW which pilot did you mean? The one who always wanted to say or the one who questioned the noise factor? I'm not a happy camper! Already having problems with my rotator cuff, saw doctor about it and she gave me pages and pages of exercise for it. Now my right knee which has been giving me twinges of pain lately decided that enough was enough and now won't let me run! I've got braces on my knee and right shoulder!!! Morning all, a posing turtle. Thanks DoA for the chuckles today. 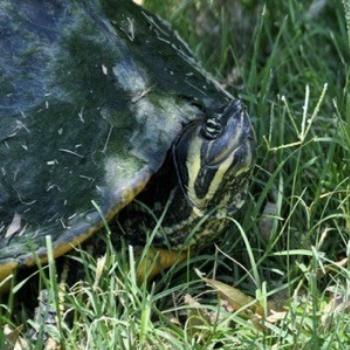 I'd say that's a close-up of a medium to small sized turtle, who looks like he's thinking about biting the camera. Geez! I can't believe it. Hal left without having a 'Fat Tire'.